The second Sunday of the NFL season is now in the books. As usual, the games included incredible plays, fun touchdown celebrations, and another poor defensive back getting run over. Dante Fowler led the Jaguars on to the field while carrying the flag for the state of Florida. The Jags also wore special stickers on their helmets to honor their home state and those devastated by the recent hurricane. Rob Gronkowski just flicks away a defender who tried to stop him from the end zone. With the Eagles trying to get into field goal range at the end of the first half, Zach Ertz got some help from the defense. Unfortunately for the Eagles, they would then miss the chip-shot field goal attempt. David Njoku got vertical during his touchdown celebration. After the Steelers scored an early touchdown, they celebrated by playing some dice. While the NFL has eased up celebrations, it may have cost Pittsburgh a point as they were going to go for two by ended up with a delay-of-game penalty and then opted for the 1-point try. The Patriots perfectly executed a field goal with the clock running in the closing seconds of the first half. The L.A. Chargers made their regular-season debut in the quaint StubHub Center. Duke Johnson made a remarkable catch for the Browns. Cam Newton is still dabbing. 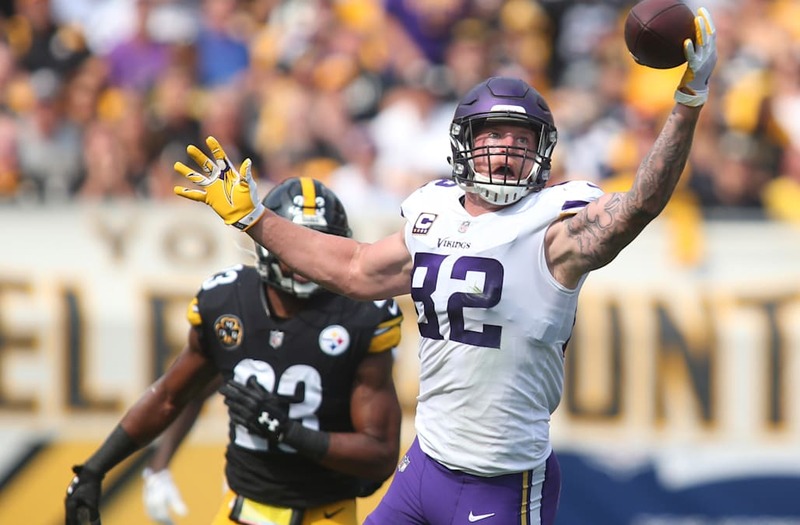 Kyle Rudolph's catch was also impressive. The Browns' rookie quarterback DeShone Kizer had leave their game with a migraine, but did eventually return. Marshawn Lynch was dancing during the Raiders' blowout win. Kansas City Chiefs tight end Travis Kelce and his brother Philadelphia Eagles center Jason Kelce exchanged jerseys after the game and even shared a kiss. Benny Fowler had a scary moment when he came down hard on his head and struggled to get off the field. The Denver Broncos-Dallas Cowboys game was briefly stopped because of lightning. Marshawn Lynch scored his first touchdown for the Raiders and the fans loved it. The Falcons were playing hoops in their new stadium. The Atlanta Falcons' new stadium and its halo videoboard made its regular-season debut. The "Sunday Night Football" crew even took a moment to say "hi" to the fans.